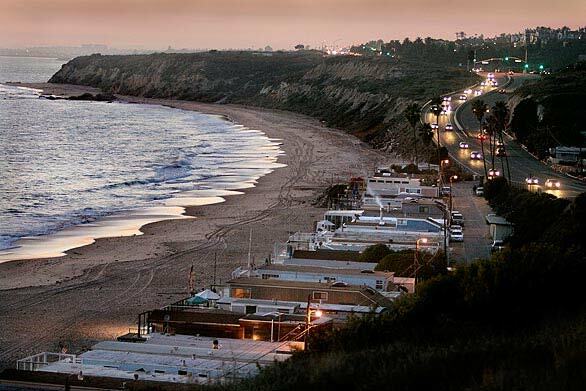 When I was a kid, I traveled this portion of the Coast Road often, as my grandparents had a place in El Morro Trailer Park and I attended El Morro Elementary, just to the right of the stoplight, at the top of the rise there in the photo. Back then, there were no stoplights. Back then, there were no buildings that you now see in the photo on the upper right, surrounded by landscaped shrubbery and trees. In my childhood, Coast Highway was four lanes across as it is now, although with little to interrupt the coastscape except for one little juice stand tucked into the cranny, a crook in the Coast Highway, near the turn-off to Crystal Cove. I get confused returning to Southern California. Everything seemed developed when I grew up down there, but it’s been so much more developed since. I saw the photo I pasted above in today’s Los Angeles Times article about work stopping due to the State Budget “mess” on converting the trailer park (the Times calls it a “mobile home” park) into a State Park. The other strange item worth noting is that the article says the name will be El Moro with one “r,” yet, for the 35 years I’ve known of this location, it has always been El Morro with two “r’s.” Why the change I wonder? Why the change? When I see this photo I remember the beach parties we’d have on the beach all summer long. Fourth of July was a madhouse with fireworks being set off at the beach dangerously close to people, since the beach was packed. Grunion runs brought out all the locals who didn’t mind touching slimy silvery little fish. Followed by a celebratory pot luck~grunion bbq on the green in the center of the park. Kids running around playing. Teens sitting around trying to be cool. Adults talking late into the night over cocktails. Good times. Always seems like simpler times then. Hey webbiepebble, did you know the McCrystals up top? Did you know the Agrens down below (I think sp. 58)? So many names that are escaping me right this minute and my grandparents are no longer alive to call and ask them. Lee & Jules were prominent residents with their kids Craig and Vanessa (am I remembering that right?). anyway, we must know the same people, yeah? I was married up on the green to D. Neuman. We had two fake pink flamingos standing in the ‘lil creeky water out front of our mobile, which ran through the tunnel and out onto the sand, where there was always a large puddle of water where are toddlers played all day, we called it “The Pucky Water”. You and I might know the same people if you lived there in late 80s? That was a great little affordable place to live at the beach and have community. I’m pretty sure the state changed the spelling and removed one “r” simply to demonstrate their power. I was at El Morro from the late 80’s to the day they shut it down. And now it sits as a wasteland, chained and fenced up. Progress??? I think not. Maudlin you say! Well then I’m the King of Maudlin! It’s not that I don’t like change or anything…I just do not like change for the worse. Interesting bit of information on the Morro/Moro names coastroad. Perhaps the State is using only one Spanish translation source for the names, since you found that El Morro can translate as The Nose and I also had found that it can also mean the Forehead as well. Yet, they chose El Moro that can mean many things in Spanish that have absolutely nothing to do with prominent points, beaches or bay’s. As you suggested it can mean Moor’s as in The Moorish as well as meaning a Male Sexist and even a Drug Dealer. Well we certainly have come along way from Nose here! It was just as you wrote back then. I had went to El Morro Elementary from 1964 until 1967. I can remember, very vividly just day dreaming out the window out of Mrs. Marshall’s 2nd grade’s classroom looking out and up at the Irvine Ranch hills behind the school, watching a couple stray cows feeding dry grasses up a little ways beyond wood post after wood post, stretched with barbed wire, climbing up the steep hill. This view gave me countless minutes to preoccupy myself went the subject became dull. Okay, so I wasn’t an “A” student in school. I have really good memories of my parents taking us to the many beaches around the area for “beach parties” with family friends that went into the night with dinner and bonfires. The Grunion runs were a special treat during those beach outings. We particularly went to Aliso Beach. My Dad and me went driving the dirt roads and hiking all over the sage, prickly pear cactus and oak tree (and poison oak) covered back hills of Laguna, mostly on Irvine Ranch. That was a great account on your experiences back then…Thank you! Hi Kate. So I was 70s and 80s down there and can imagine that you definitely experience that confused feeling doubly more than I! Exactly that, I’ll be on a street whose name I know, MacArthur Blvd. or even Laguna Canyon Road, but there is so much change that I know longer no where I am, and I begin to forget how I remember it used to look. Yeah, I grew up down there in the 50’s and 60’s. I watched the orange groves and strawberry fields disappear, and Laguna Beach go from a sleepy artists beach community to wall-to-wall people, cars, and buildings. I was down in September, and I got lost, over and over again. Even though some of the street names were the same, the landmarks of my childhood were gone. It is so sad to me.